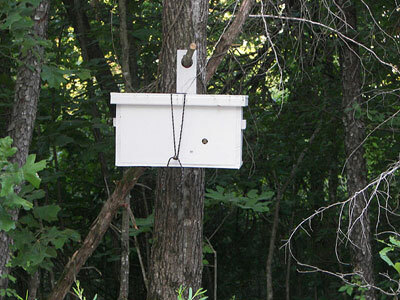 Do you know where a wild bee hive is? During August through to January, unmanaged beehives will normally swarm, occasionally more than once! The swarm of bees could move in to wall cavities or eaves of buildings, inside compost bins, flower pots, utility pit covers, bird boxes, tree cavities better used for Australian Natives or any other sufficiently size cavity space where they may be unwelcome, this is where a Bait Hive, also known as a Swarm Trap can help! PLACING A BAIT HIVE IS FREE! The Bait Hive works by been of a certain size cavity that the bees are looking for (enough space to build). It also contains some bees wax to make the box more appealing, as well as a lure that mimics bee pheromones to attract the scout bees looking for a new home. The Bait Hives are placed in strategic locations (landmarks) that bees may fly by regularly as they navigate by the sun and landmarks. 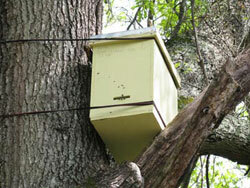 The hive itself is usually placed 2-3 metres up off the ground on the south side of a tree facing east. The purpose of a Bait Hive- is to provide a place for these wild swarms to move in to rather than where they are not wanted. Bait Hives are checked regularly and once a swarm has moved in, I will come back either late evening or very early morning to close the bees in the box and take them down from the tree and relocate them. Bait hives work best if located near to known locations of hives, this increases the likely hood of catching the swarm that the wild hive sends out. There is international bee die offs due to a range of pests, diseases, loss of habitat and insecticides, by providing these wild bees a home, we're ensuring that we keep genetic diversity in our honey bee stock. Therefore these bees are saved from possibly been exterminated if they had moved in to where they're not wanted. Some beekeepers prefer to use local bees that have been able to survive on their own in the wild and local weather conditions making them better suited to our area. It's much easier catching swarms this way than removing them from walls! And the bees will have a better chance of survival by going into managed hives by beekeepers. If you would happen to know of any feral / wild hives (in trees etc) between within the Darwin / Palmerston / Berry Springs (Northern Territory), or even if you have hives yourself that might send out a swarm or two, please contact me with the location/s of the hive/s. I would like to compile a map of these locations for the purposes of placing placing bait hives within 200m of the hive's (depending on location) at the start of August. Please help us save bee swarms!